I absolutely love treating children and adults with fluency disorders. I’ve found some great materials online, but I also wanted to design a few of my own that reflect my therapy philosophy. My treatment approach is based on the idea that: Stuttering is a neurologically based disorder with a multidimensional presentation. People who stutter display core behaviors resulting from structural and functional differences, but those behaviors are really just the start of the problem. Over time, people develop maladaptive thoughts and feelings about themselves as communicators, as well as situational avoidance and linguistic “triggers” (e.g., ““B’s” are hard for me. I just can’t say any word that starts with “b”.”). These learned responses can give way to a whole host of overt (e.g., gasping, head jerking, eye aversion, phrase repetitions, excessive use of fillers, etc.) as well as covert reactions. I began my clinical experience with adults who stutter, but after working with children, I’ve come to realize that even very young kids develop negative thoughts, feelings, and avoidance behaviors. For these reasons, stuttering therapy (even for kids!) should strive to address the multidimensional nature of the disorder. When we focus solely on “smooth talking” and “easy speech” without addressing the other complexities, we do the child a disservice. And so the Fluency Starter Pack was born! 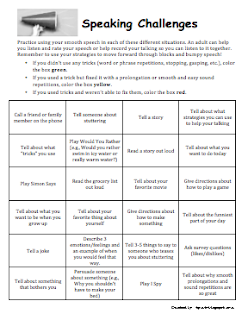 I just posted this hearty packet to my TpT store and I’m providing the first page – “Parent Intro to Stuttering Therapy” for free to my blog followers. Please check it out and consider supporting my work with your purchase! 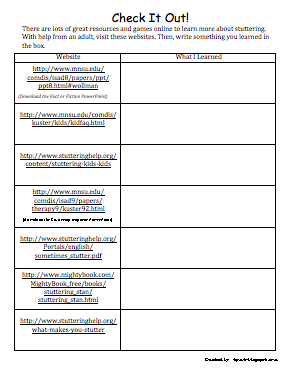 See below for an outline – I’ve also included links to some great free resources that supplement my packet. Page 1: Parent Intro to Stuttering Therapy: It is amazing how much inaccurate information parents receive about stuttering. Mostly from the internet, but also from pediatricians! Many of them still believe that their 10-year-old will “grow out” of stuttering. Some think that they caused their child to stutter, and others believe that it is purely a problem of confidence. Needless to say, parent education is a huge part of the job. 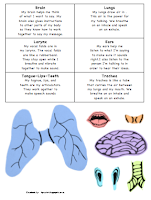 This one-page introduction summarizes the causes of stuttering, the multidimensional nature of the disorder, highlights good internet resources, discusses what to expect from treatment, and ways to support students at home. Of course, parent education will be continued over the course of many conversations, but this is a good place to begin. Best of all, I’m giving it to you for free!! 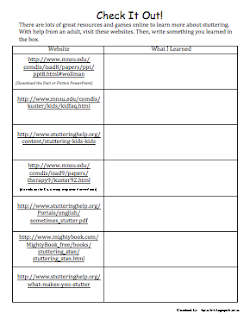 Download directly from my Google docs, and then zip on over to my TpT store if you want more! 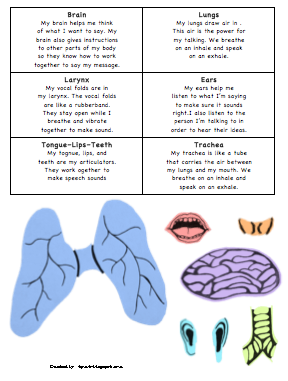 Pages 2-4: My Speaking System: I like to briefly go over the speaking system with my fluency students. I know that time is tight sometimes, so this activity is designed to be flexible, whether you have 5 minutes or 30 minutes. Here are some ideas for using it: (1) Start by watching this short video (2) Show the kids where the different parts are housed within their own bodies (e.g., put hands on rib cage, take deep breaths and talk about the lungs as “balloons” inside the ribs) (3) After watching the video and exploring a bit, have the kids simply label the parts on the worksheet or (4) Cut out the short descriptions and match the anatomy to the function. The older kids would benefit more from putting the descriptions into their own words and writing in the boxes. (5) Finally, have the kids either color in the parts or cut and paste each piece (I’ve provided both grayscale and color options). Alternatively, cut and laminate the pieces and attach Velcro so you can reuse them for a matching game. Page 5: My Stuttering Fingerprint: I have worked with many children and adults who stutter and I have never seen the same pattern twice! This is because the pattern of learned reactions and avoidance behaviors are built up differently for each person. 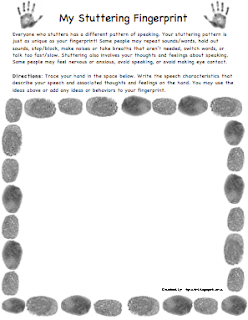 Use the Stuttering Fingerprint worksheet to begin exploring different types of maladaptive behaviors (as well as thoughts and feelings if you get that far). Keep it light and fun – Give lots of praise when they are able to self-identify behaviors. You may need to model a bit to get them started (e.g., “I’ve noticed that s-s-s-ometimes I-I-I-I repeat the first sound of a w-w-w-word. Does anybody else ever do that?”) and/or incorporate some hands-on metaphors (e.g., bumpy/smooth tracks with cars, bumpy/smooth marble runs, etc.). Watch Stuttering For Kids By Kids (clips or in entirety) as an introduction to this lesson. You can start talking about some of the behaviors you see the kids in the video using. Page 6: My Speech Cards: This exercise is really a continuation of the Stuttering Fingerprint activity. Basically, you name each feature of the stuttering pattern (use the child’s words – If “bouncy words” is their way of describing sound repetitions, then that’s what you use! ), make a quick picture, and explain whether the behavior is helpful or harmful. 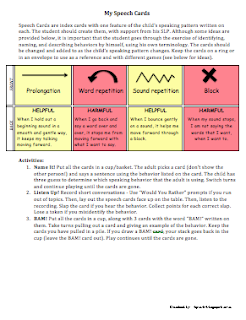 I think it is so helpful to develop these cards early in therapy – You will end up using them every session! See I Have A Voice for explanations and recorded examples of different types of stuttering behaviors. 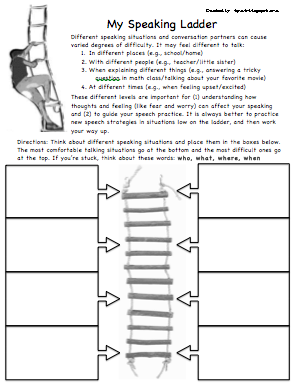 Page 7: My Speaking Ladder: Different speaking situations and conversation partners can cause varied degrees of difficulty. It may feel different to talk: (1) In different places (e.g., school/home), (2) With different people (e.g., teacher/little sister), (3) When explaining different things (e.g., answering a tricky question in math class/talking about your favorite movie), and (4) At different times (e.g., when feeling upset/excited). 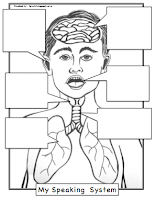 These different levels are important for (1) understanding how thoughts and feeling (like fear and worry) can affect speaking and (2) to guide speech practice. It is always better to practice new speech strategies in situations low on the ladder, and then work your way up. 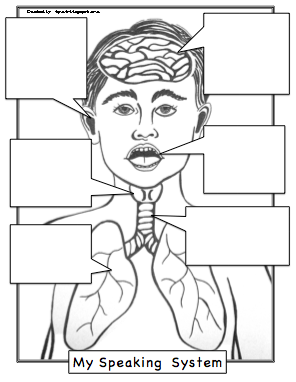 This activity is a great starting point for talking about the cognitive and affective components of the disorder. Fluency Friday has some great PowerPoints available to continue the discussion, covering negative thoughts and avoidance. Page 8: Reducing Tension: The feeling of helplessness and loss of control is one I hear a lot from kids (e.g., “There’s nothing I can do to stop it!”). Working on modulating tension is a powerful activity to show them that they are in control of more than they think. Start with some hands on metaphors – bring in a rope and have two people hold an end. When the rope is relaxed, you can swing it up and down easily. But when the people move backwards and make the rope really tight, it does not move up and down as freely due to the increased tension. Even after completing the worksheet, you can use different passages (e.g., read-to-self book, articles used in class, even posters in the hallway) to continue practicing this important skill. 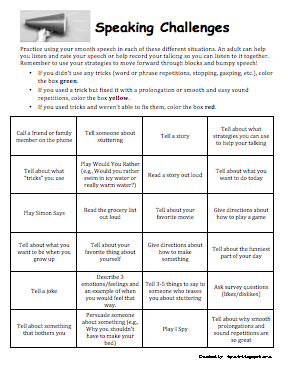 The Speak Freely workbook has made several pages available for free – Relaxing the Stutter is one of my favorites for older kids! Page 10: Speaking Challenges: I am always scrambling to come up with homework assignments for motor practice. This sheet includes 24 prompts and instructions to rate speech and document performance using a coloring rubric: Color the box green if you didn’t use any tricks (word or phrase repetitions, stopping, gasping, etc. ), yellow if you used a trick but fixed it with a prolongation or smooth and easy sound repetitions, and red If you used tricks and weren’t able to fix them. I hope this packet gets you feeling prepared and excited to greet your fluency groups! Don't forget to pick up your complete packet at my TpT store. Thanks for your support!